The “modernist” approach of many theologians did not recognize its own limitations, and it claimed too much for itself. Why should it necessarily be the case that using a light bulb and understanding entirely how it works stands in tension with belief that God intervenes directly and powerfully in our lives? We are dealing with two different types of causation, one natural, and the other divine, or supernatural, and neither type of causation excludes the other. To equate the two is what philosophers call a category mistake. In other words, we can fully affirm the laws of science and nature while also understanding that God is not bound by the way in which they normally work. When divine healing takes place, for example, God may accelerate an entirely natural process, or God may work in a way that is not beholden to natural processes. Marcus Borg has written of a “precritical naiveté” that people raised as Christians possess before they develop into critical thinkers with more sophisticated and realistic notions of the meaning of biblical stories and God’s work in the world. Once we begin to step out from under the influence of the authority figures who told us that the stories of the Bible were true, he argues, we will begin to see that we really should not take these stories literally. The resurrection of Jesus, for example is a repository of metaphorical meaning, but Jesus himself did not bodily rise from the dead. It is not my intention in this chapter to argue that we should turn off our critical and analytical faculties when we read the Bible. I also want to emphasize, however, that many of us possess an uncritical naiveté with regard to modernity itself. Why should we take such a critical stance toward the worldview of the ancients while allowing our own worldview to remain unexamined? We need to move beyond an uncritical and naive acceptance of the modernist worldview. I want to affirm scrutiny of the biblical texts using all of the tools of critical biblical scholarship. I spent years during my PhD work learning to use these tools, hopefully with some degree of skill and sophistication. What I do not affirm, however, is skepticism. As Christians, we should not simply begin our reading with a stance of unbelief toward the stories of God’s great works in history. We should approach the Bible with a willingness to receive news of God’s saving action through Israel, Judah, Jesus, and Jesus’ first followers. As we read these stories with a sense of openness to what God has done and what God might teach us, we might begin to expect God to show up in similar ways for us today. Speaking personally, the modernist approach was at one time most compelling to me. I’ve simply changed my mind over the years, partly because of scholarly work on divine action and epistemology, but also because of experiences I have had, as well as conversations with friends and colleagues. My colleague Andrew Park introduced me to Randy Clark, and getting to know Randy has had a big impact on my thinking. I’ve also grown a lot through my involvement in Aldersgate Renewal Ministries. (I’d really encourage going to their annual gathering this summer.) Going to places like Cuba and Vietnam has changed the way I think, as well. In these contexts, miracles are simply accepted as part of the fabric of religious life. scholars working today, and his personal experiences with the miraculous have given rise to this excellent scholarly text. (He’s also a super-nice guy, by the way.) There are several videos of Keener on Youtube discussing his interest in and thoughts on miracles, in case you’re interested. For a more accessible approach, pick up a copy of Eric Metaxas’s work, Miracles: What They Are, Why They Happen, and How They Can Change Your Life. It gets at complex philosophical ideas in a very clear and readable manner, and would be a great choice for a study at church. Part One of this book is called “The Question of Miracles,” and it deals with such topics as miracles and science and the possibility of believing in miracles in our present context. Part Two, “The Miracles Stories,” will likely be most meaningful to most readers. 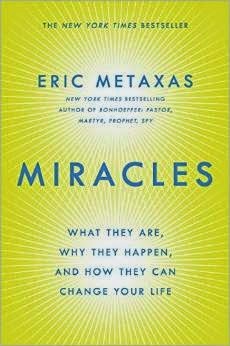 In this section, Metaxas chronicles a number of accounts of miracles that he has investigated, and a few of which he experienced personally. Several of these accounts are quite moving. There are no easy answers as to why miracles happen in some cases but not others. Nevertheless, the older I get the more convinced I am that, while God is always present and at work in our lives, there are times when God’s work is more powerfully present and directly observable. Perhaps in years to come there will be as much scholarly attention to understanding miracles as there was to debunking them in decades past. “In spite of its important insights, one of the areas in which the modern period has miscarried is in its failure to regard itself as a historical moment. In its attempt to free the Bible from the stranglehold of the dogmatic theology that determined in advance exegetical outcomes, it failed to understand how it had located the legitimate interpretation of Scripture in its own modern ideology. Reading the stories of healing in the Gospels or Paulin accounts of visionary experiences within a naturalistic, deistic framework predetermined a reading of those narrative and epistolary texts that disallowed the possibility of the phenomena they presuppose.” Joel B. Green, “Scripture and Theology: Uniting the Two So Long Divided,” in Between Two Horizons: Spanning New Testament Studies and Systematic Theology, ed. Joel B. Green and Max Turner (Grand Rapids: Eerdmans, 2000), 28. Marcus J. Borg, Meeting Jesus Again for the First Time: The Historical Jesus & the Heart of Contemporary Faith (San Francisco: HarperSanFrancisco, 1994): 6, 8. June 28, 2016 in miracles, modernity. ‘Miracles”? I remember that just these few pages have made all the difference to me. I’m sorry to get off topic, but I am hurting from being disinvited from commenting on your article “http://unitedmethodistreporter.com” Do You Believe in Miracles? Apparently asking people to substantiate assertions that they have make is not permitted. Maybe I have transgressed, for which I am truly sorry. I ask myself daily “what do you expect of me Father, Abba, Daddy?” And I don’t really get any answer! An answer should be forthcoming soon! Otherwise why should I bother showing up next Sunday? I have had great difficulty posting this. Have you consulted C. S. Lewis’ “Miracles”? I remember reading the first 3-5 pages and being seriously impressed. I have spent some time composing, and lamenting about this article several times. When I post it, it seem to just disappear. I remarked, asked, why you did not cite C. S. Lewis’ Miracles.???? I apologize for being off topic. I was disinvited from commenting on your article “One Church, One Organization, or Neither?”” Maybe it was appropriate, for which I am truly sorry, but not being able to clarify what peoples positions are seem to me to be very unhelpful at the least. I ask my self every day, “what do you expect of me” Lord, Father, Abba, Daddy. I have received no answer. Why should I show in church this coming Sunday? Does anyone in our denomination really care? Time is running out!